Your home’s backyard can be more than just a blank patch of grass — it can be a blank canvas where you can paint a masterpiece. There’s so much untapped potential just outside the walls of your home, and all it takes to realize that potential is the right idea. Whether your backyard becomes a private outdoor refuge from the stresses of your day; a gathering place for friends and family to enjoy a meal under the stars; or a playground for your kids to enjoy the outdoors and make memories, how you utilize your backyard is up to you. You’ll not only create a space you and your family can enjoy to a greater extent, but you’ll also be adding significant value to your home — turning it into a much stronger investment. There are numerous ideas for improving a backyard and making it into a special place. 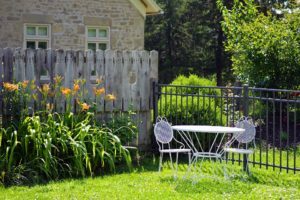 Some of the best and most commonly used ideas revolve around taking full advantage of your backyard’s most unique feature — the outdoors. For example, planting a garden can be a relatively easy but beautiful way to create an outdoor space that promotes calmness while also presenting you with a ready-made hobby to keep you occupied. An outdoor fire pit means you can extend the life of your backyard into the evening hours and chilly fall nights. Water features such as koi ponds, fountains or waterfalls bring the gentle sound of babbling water to your backyard space and create a Zen-like area of rest to help you relieve stress. The backyard also can be an extension of the living space inside your home, giving you additional space for entertaining, cooking or just enjoying time with your family. Even something as simple as adding an outdoor barbecue grill makes it possible for you to feed friends and family while soaking up some sunshine. There’s nothing quite like the combination of clean air and the smell of freshly grilled food. Strategic use of outdoor lighting can turn an outdoor space into a cozy spot for gathering with friends, as well. The backyard can be a place of tranquility, but it also can be one of excitement and fun. A backyard pool is the most obvious way to transform your yard into a fun zone. A backyard playground will give your kids a place they can call their own, too. The following slideshow gives you 10 ways you can improve your backyard — check it out and be inspired.